By Chris Williams: Well, Bob Arum has finally spilled the beans by revealing that he’s trying to wrap up negotiations between Juan Manuel Marquez and Manny Pacquiao for a December 8th fight in Las Vegas, Nevada, according to Dan Rafael. 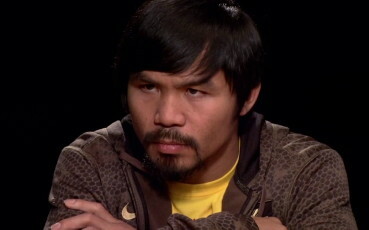 With Pacquiao getting $20 million+ guaranteed per fight, it was pretty much going to be Marquez the entire time. It’s not as if Arum could get $20 million for Pacquiao if he matched up against Tim Bradley again, because their fight last June brought in disappointing numbers in terms of PPV buys. As for Bradley, the odd man out, Arum is going to have him fight in New York next at Madison Square Garden to “expose him to the fans and media in New York.” You know what that means. Arum is probably going to try and match Bradley up with Miguel Cotto. That seems like a given because Arum doesn’t have any popular New York based fighters in his Top Rank stable. Cotto is no longer a Top Rank fighter, but he’s someone that Arum might be able to use for Bradley, as long as Bradley wins his next fight in New York against a likely fringe contender and is willing to fight Cotto at 154 lbs. I doubt Cotto will change his mind about not wanting to fight at a 150 pound catchweight. He already turned it down for a fight against Pacquiao, and I can’t see him changing his mind for a much less popular fighter in Bradley. I’d be surprised if Cotto agrees to fight Bradley, because there’s no upside to facing him because he doesn’t bring much to the table in terms of fans. Marquez is getting the fight with Pacquiao because Cotto decided he didn’t want to fight at a catchweight against Pacquiao. He reportedly turned down a huge amount of money that was offered to him to fight Pacquiao, but wouldn’t do it because of the weight, among other things. Arum pretty much had to match Pacquiao up with Marquez in order to keep getting him the huge paydays that he’s been accustomed. I just wonder what happens after this fight. If Pacquiao looks terrible again and wins another controversial decision over Marquez, Arum isn’t going to get a fight with Floyd Mayweather Jr. off of that kind of win for his Filipino fighter. Unless Pacquiao is open to taking less than a 50-50 deal, Arum is going to have to look to match him up against either Marquez for a 5th time or Cotto. He won’t be able to use Bradley because he probably won’t be anymore popular than is now. This means that Pacquiao will have to agree to fight Cotto at the full 154 pound weight for the junior middleweight division if Arum wants to get him another big payday. It’s either that or take a smaller cut to fight Mayweather. And sadly, if neither of those two fights come off look for Arum to trot out Marquez for a fifth fight. That’ll be hilarious if that happens. Marquez getting picked over and over again to fight Pacquiao just to keep getting big paydays while the boxing public gets turned off.